On September 18, 2012, Orbit Research announced a second-generation version of the iBill® Talking Money Identifier. When the original iBill® was released in late 2009, it was truly a very competitive product. Other currency identifiers were priced over $300, and they were too large–so large, in fact, that they could not fit in your pocket. The original iBill®, on the other hand, was light, small, and priced at $99. 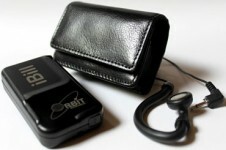 Moreover, it could be set to speak, beep, or vibrate; and people who were deaf and blind could use it. I am not one who automatically accepts the claims made by companies extoling the virtues of their products. I prefer to rely on personal experience or to solicit the informed views of people whose judgment I trust. In the case of the iBill®, Orbit Research claimed that it was able to identify paper currency in less than a second and that it was better than 99.9% accurate. My personal experience has proven this to be true. The iBill® has never misidentified paper currency; the worst thing that happens is that you get a message which says “error,” which means that you should try reading the currency again; and this happens so rarely that I can’t remember the last time it happened to me. For the hundreds of times I have asked the iBill® to read paper currency, it has always come through in less than a second. The buttons on the second-generation iBill® are recessed so that they are not pressed inadvertently when it is placed in a purse or pocket. The second-generation iBill® has corners that are more rounded, giving it a more compact feel. The new iBill® has an earphone jack; you can now have your currency read out loud without other people listening (an earphone can be obtained from Orbit Research). A new and improved reading slot makes it easier to insert older currency into the iBill®. You can now use a finger to push older currency further into the slot. The volume has been enhanced so that the iBill® can speak even louder than ever. The bottom line for me is that even though the price of the new iBill® is $20 more (it is now priced at $119) than the original, it is still well worth the price–that is, if you are looking for a reliable, long-lasting, and durable currency identifier. Smart phone users will be quick to point out that some very good currency identification apps exist for the iPhone and Android smart phones, and they are certainly far less expensive than the iBill®. For those of you who do not want or need a smart phone, the iBill® is there for you–and at an affordable price. About a month ago, I purchased the Olympus DM-620 digital voice recorder in my ongoing quest to acquire the latest and greatest in nonvisually-accessible digital recorders. The Olympus DM-620 digital recorder is the latest in a line of Olympus digital recorders with voice guidance that makes most of the recorder’s settings and features nonvisually accessible. Other Olympus models that can be purchased with voice guidance are the Olympus DM-420, DM-520, DM-2, and DM-4. With the voice guided prompts, most of the recorder’s features are nonvisually accessible. It is still not possible to set the date and time without sighted help, and information about how much memory and/or recording time you have available is still not spoken, but the important settings can be adjusted with the help of voice guided prompts. I needed a little bit of sighted help to install the batteries and to identify some of the buttons. However, after only a few minutes, I was able to operate the DM-620 and change settings on my own. Pressing the Menu buttons starts the voice guidance which allows many recorder settings to be changed. The first thing that you will probably want to change is the speed of the voice prompts which, by default, are set to speak fairly slowly. Another setting that you might want to change is the format of the recording files. I prefer to use the MP3 format at 128KBPS. The Olympus DM-620 provides five folders that can be used to hold audio recordings. They are labeled “Folder A,” “Folder B,” and so on. Each folder can hold up to 200 files (i.e., recordings). I have found with some digital recorders that it is often a bit tricky to know which folder you are using. What I have done to overcome this problem is to record an audio file in each of the five folders stating the name of the folder. For example, in Folder A, I record a file which says “Folder A”. Then, I lock the file so that it cannot be erased accidentally. Files can be easily locked and unlocked through the menus, and all of this is accessible with voice guided prompts. There is an electronic version of the User’s Guide for the Olympus DM-620, available as a PDF document: DM-620 Detailed Instructions (English). While much of this is readable with screen access technology, the file is formatted for visual presentation, and some of the information consists of unlabeled graphics. Nevertheless, I found that, with some effort, some useful information can be extracted from the PDF document. All of the Olympus digital recorders I have used over the years have the ability to pause during recording and playback. This means that you can stop the recorder at any time to avoid recording any unwanted information or pause while listening to long recordings. 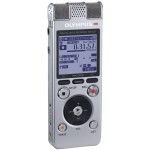 Unfortunately, there seems to be no ability that I am aware of in the Olympus digital recorders with voice guidance to insert or add to recordings after they have been stopped. All in all, I believe that the Olympus DM-620 is a very useful digital recorder, and it is reasonably accessible to the nonvisual user. The PLEXTALK Pocket PTP1 is smaller than most cell phones, yet it is packed with powerful potential—everything you would want in a digital book reader, plus a few great features you may not have known were possible. It supports all of the popular book formats, including NLS/BARD, Book Share, Learning Ally, and Audible. It has integrated support for Microsoft Word files, encoded Braille, HTML, and plain text using the built-in speech synthesizer. The big difference between the PLEXTALK Pocket and other digital book readers and music players is its compact size (approximately four by two inches, or ten by five centimeters), outstanding recording capability, and built in wireless network access features. Before we look at the amazing new wireless features, let’s examine the unique recording and playback capabilities. The PLEXTALK Pocket will play back audio in MP3, WAV, WMA, OGG, and AMR WB+ formats. It is easy to navigate through the files using the keypad and arrow keys and enhanced navigation support is provided for DAISY titles. You can also set bookmarks and optionally record annotations and it will remember your last reading position for up to one thousand books. 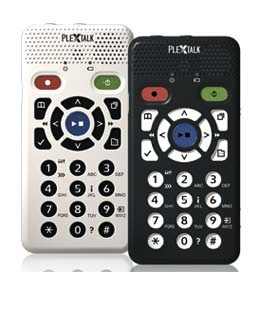 The quality of recordings made with the PLEXTALK Pocket is some of the best we have heard. There are two recording modes. The long format, or main recording mode, using the internal microphone, an external microphone, or a line-in from another device, saves recordings to the SD card. This mode is suitable for recording lectures or other live events. The short format is for recording “voice memos.” These recordings can be up to one minute long and are stored in MP3 32 kbps mono format. Since they are stored in the PLEXTALK Pocket’s internal memory, voice memos remain with the PLEXTALK Pocket even if you change SD cards. There is enough internal memory to hold about thirty minutes of recorded memos. The PLEXTALK Pocket has some unique features for controlling the recording. You can monitor the recording using earphones and receive periodic audible feedback about the recording input level. You can either start a new recording or append to an existing one and select from either automatic or manual gain control. Of particular interest is the DAISY recording feature that allows you to set index heading levels from one through six during recording or playback and later use them to navigate through the recording using any DAISY reader. You can edit your recordings using the selective delete function of the PLEXTALK Pocket or the included PRS Pro DAISY editing software. We think the best feature of the PLEXTALK Pocket is the wireless networking. Once you establish a wireless connection to your router, you can access some pretty exciting features. You can listen to a variety of streaming Internet radio stations through one of the best speakers we have heard on any portable reader. It is easy to select a station from the list provided or to add your own favorite stations. And, both MP3 and WMA stream types are supported. 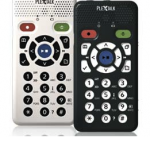 We were interested in the PLEXTALK Pocket when it was first introduced but the new wireless support and a special sale price from Freedom Scientific put us over the top. It gets a strong five robots rating from us and it will get a big work out during the coming school year. If you would like to learn more about the PLEXTALK Pocket, Jonathon Mosen of Freedom Scientific has produced a very nice podcast demonstrating its myriad functions and features in detail at the FScast website. One of the challenges we face every semester is tracking down all of our textbooks in accessible media. It can be a real scavenger hunt picking through the wide variety of sources and formats available today. In a single semester, the mix may include recorded audio, plain text in PDF format, or any of the various indexed formats such as DAISY and epub. And then, when no other source can be found, there are the dreaded scanned textbooks that come with their own set of problems. Most schools and universities have a professional who assists students with the task of procuring textbooks in accessible media. However, there are many times when it is necessary for us to do the leg work ourselves to ensure we have all the materials we need. A great resource for finding the books we need for school is the AccessText Network . The mission of the AccessText Network is to help “college students with print disabilities by connecting their disability service offices directly with leading textbook publishers” to obtain textbooks in accessible media. 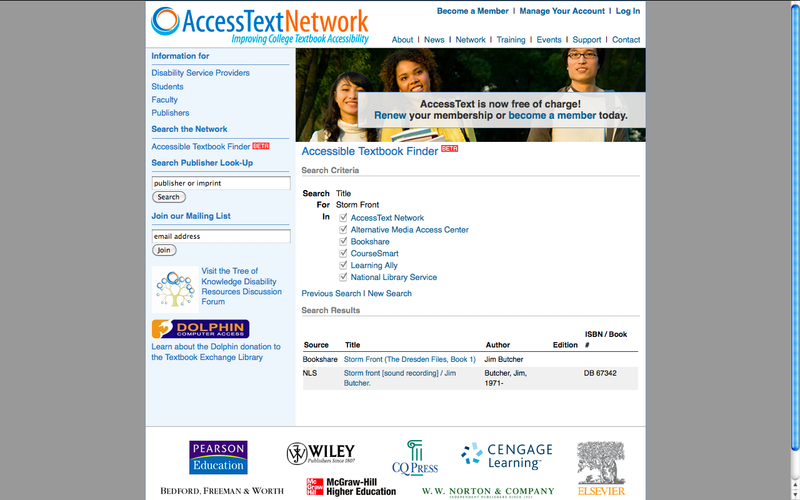 Although membership to the AccessText Network is limited to educational institutions, the free search engine available on their web site is a very convenient way to search the catalogs of a growing number of textbook publishers and accessible media providers including the National Library Service, Book Share, and Learning Ally. 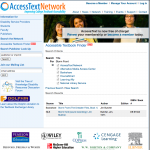 In order to search for textbooks, navigate to http://www.accesstext.org and click on the “Accessible Textbook Finder” link. Select “ISBN” or “Title” and select the catalogs you would like to search (all are selected by default) and click on the “Search” button. The page is very accessible and easy to use with a screen reader. Let’s give it a try. A search for the commonly assigned Computer Science textbook “Introduction to Automata Theory” found one result. Since the result was found in the AccessText Network catalog, the accessible media edition will have to be requested through the university’s disabled student services office. Had the book been found at Book Share or Learning Ally, we could have immediately downloaded from their web site using our personal membership accounts. What about general reading titles? We decided to try a search for a title by one of our favorite Science Fiction writers, Jim Butcher. The first book in his Dresden Files series is called “Storm Front.” We clicked on “New Search,” changed the search type to “Title” and typed in the name. Scrolling down to the search results, we found that the book is available from both the National Library Service and Book Share. This means we have three accessible media format choices: formatted Braille (BRF), Digital Talking Book (DAISY) from Book Share, or recorded audio from the National Library Service. The ability to search the National Library Service, Book Share, and Learning Ally in a single search is perhaps the best feature of the book finder for most individual readers. What hoops and hurdles have you faced in your quest for higher learning? Leave a comment with some of your experiences with tracking down books in accessible media.